The primary classes group children ages 2½– 6 under the direction of Montessori-certified head teachers and classroom assistants. It is the teachers responsibility to observe each child as an individual. Lessons are then are focused around each child’s individual needs and interests while exposing them to all areas of the curriculum. As in a family, children learn from and assist one another. Children are free to move about, talk, and work with materials . All materials are designed to be manipulated, and the children are encouraged to repeat activities as long as interest remains. Learning materials are within easy reach and invite exploration. A child may work alone or may ask others to share in a project. Children are allowed to develop at individual rates and according to their interests. Within this prepared environment a spirit of freedom and its accompanying responsibility flourishes. Because young children rely on a consistent routine in their life to function at their best, we offer only full-week programs. Children ages 2½-6 attend school for a full day, 8:30-2:30. For families needing additional care, we offer an Extended Care Program – Educare. Just as it is important for children to arrive at school daily and on time, it is important for them to remain in the same class for three or four successive years. Not only do the children develop a close relationship with their teacher, but the teacher has the ability to truly see a child through all of his “sensitive periods” and give specific lessons accordingly. Children, as adults, go through periods of high and low productivity and interest. If a child remains in the same class for three to four years, they will be sure to experience all the materials necessary for them to fully develop. Practical Life materials develop coordination and independence and help children feel a part of their environment and culture. These include activities such as polishing, washing, pouring, dressing skills, food preparation, and social skills. Sensorial materials are designed to help children develop perception of differences in qualities, such as length, weight, and sound. These activities help children focus on the details of the world around them. Language materials help children increase their vocabulary, explore the sounds and syntax of the English language, and learn to read. Math materials demonstrate the functioning of the decimal system as children learn to count and work with quantities. Cultural activities provide children with information about geography, history, music, art, and natural science. The factual information that children amass in the primary class is the basis for the exploration of relationships in the elementary class. A detailed curriculum list is available in the school office. Understanding Order: Learning to put things away in the proper place, keep track of belongings, and to follow the intrinsic order of the materials. Taking Turns: Waiting to use favorite materials, have a seat at the snack table, or have the undivided attention of an adult. Doing Things For Oneself: Zipping, buttoning, etc. are skills that come out of the necessity of taking care of oneself. Seeing older children doing these things develops interest. Language Skills: Increasing new feelings and experiences eventually broaden the range of expression. Wanting to Work: A strong drive to learn new things is developed through seeing the accomplishments of other children. The teachers always plan their day, week, month, and even year. 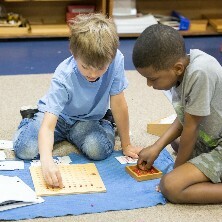 Although many lessons are spontaneous, a plan is necessary to ensure that all children are receiving equal attention. The teachers also keep detailed records on each student’s progress academically, socially, and emotionally. Parent-teacher conferences are scheduled twice a year to keep parents informed on their child’s progress. In addition, progress reports are given at the spring conference. Teachers are also available for additional conferences throughout the year when necessary. Respect the environment. Take care of the materials, our classroom, and our school. What sets our school apart from others is the way we enforce these rules. Each child knows exactly what is expected of him/her. When behavior becomes inappropriate, choices are given and natural consequences follow. Our approach to each child is positive, yet consistent and firm. As children begin to mature, their freedom and responsibilities increases accordingly. They are able to choose what they want to do, when they want to do it, and how. 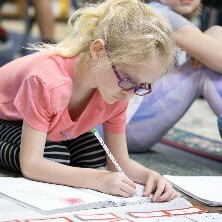 In the elementary years, students gradually develop the ability to think abstractly, become aware of their personal interests, and begin to develop their morals. They take their first step toward making a conscious contribution to the world. In the elementary class all academic areas are studied. As in the Primary classes, students acquire the basic skills through concrete materials that move gradually to the abstract. These skills allow them to gain access to the real substance of the curriculum, such as science, history, great literature, and fine arts. Integrated lessons move from the general to the specific, allowing students to put the information perspective and to understand the interrelationships in our world. Complex subjects, most interesting to this age child, can be made accessible when presented in a consistently organized manner, accompanied by corresponding vocabulary, and experienced with concrete materials. Lessons are carefully interwoven to lead children into research and writing about subjects that have captured their imagination. Exposure to high level of ideas not only lays the foundation for future study but also brings the child to a consideration of his/her own purpose in the world. The child’s relationships with teachers are friends are used as opportunities to teach how to treat others with courtesy, to analyze problems logically, and to resolve conflicts peacefully. Care is given to assure that the child masters the basics and is well prepared for a traditional class setting. A nationally standardized achievement test is administered each year to all elementary students. A detailed curriculum list is available in our school office.